Sieve flour together with salt. Cut the margarine in cubes and knead with flour, till the mixture looks like breadcrumbs. Melt the yeast in a glass with a little warm water, make a whole in the middle of the flour, pour the melted yeast and knead. Keep adding warm water little by little till need be, cover and leave for two hours. Crush the fresh cheese and mix it with all the ingredients. It is important that mixture does not become liquid, so it’s better to pour eggs one by one, and use depending on the density of the mixture. Cut pastry in sizeable portions, open with a lembuba(pleat/rolling pin), pour a spoonful of mixture on it and close the pastry. Brush the egg yolk on the pastry and bake in very warm oven until golden. 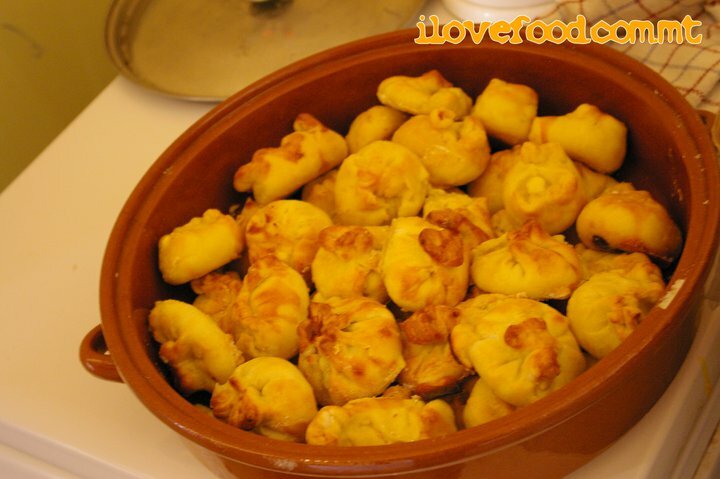 This entry was posted in By Occasion, Desert, Easter, Recipes and tagged food, helu, Recipes, sweets, traditional maltese recipes. Bookmark the permalink. Is it possible to use butter instead of margerine as I do not use margerine at all.